Do you work long hours or travel for work often? Do you spend a lot of time away from the people you love? In today's hectic world, it's easy to get lost in the hustle of everyday life. We can forget how easy it is to show someone how much we love them. Little gestures can make a huge difference in your relationship. That's what making the postcard promise is all about. 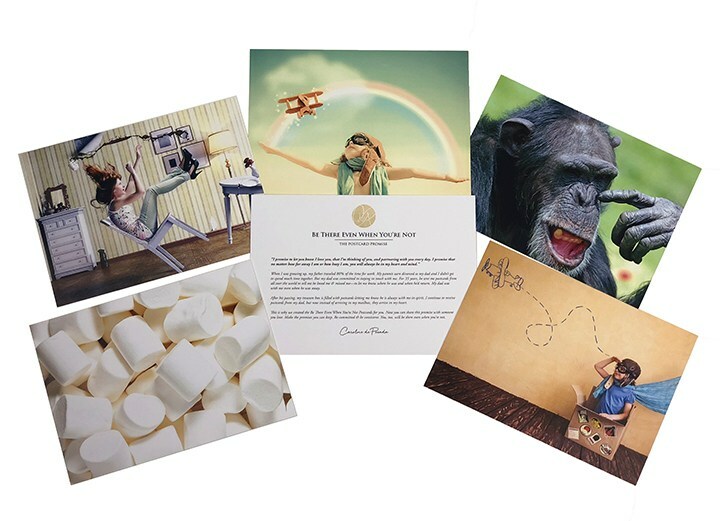 Sending a postcard is different than an email or a text message because they are tangible. Your loved one can hold them, feel them and keep them forever. They can see your handwriting and feel the effort you put into sending them. These postcards will add that special touch to your most meaningful relationships. 5 unique images with personalized messages on the back. Postcard leaflet sharing the story behind the postcard promise. Arthur is a chauffeur who is intellectually gifted. Jonathan is no less bright than Arthur, equally hard-working, and a billionaire. So why is Jonathan in the back seat of the limousine and Arthur in the front? What explains the difference between success and failure? And what does it mean to you and your children? Joachim de Posada, a world-renowned motivational speaker, found the answer in a landmark Stanford University study of children who were able to delay gratification-in the form of a marshmallow they'd been given to eat-with the promise that they'd be rewarded with an additional marshmallow if they resisted eating the first for fifteen minutes. Ten years later, the children who held out had grown up to be significantly more successful than those who had eaten their marshmallow immediately. Posada saw that the key difference between success and failure is not merely hard work or superior intelligence, but the ability to delay gratification. 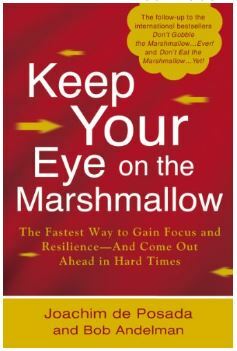 "Marshmallow resisters" achieve high levels of success while others eat all their marshmallows at once, so to speak-accumulating debt and dissatisfaction despite their occupations or incomes. But it doesn't have to be that way. 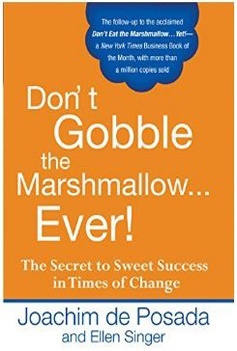 Using a simple parable and real-life examples (including basketball great Larry Bird and major league baseball catcher Jorge Posada, Joachim's cousin), this life-changing book shows readers how the moves made today can pay off big tomorrow-if they just don't eat the marshmallow...yet! After facing many hardships and challenges, former chauffeur Arthur has come out on top, happily married and at the pinnacle of his career. But Arthur has always had a dream of starting his own business. In the face of a difficult economy and his own fears of success, Arthur begins to flounder in his new endeavor and forgets all of the principles his former boss, billionaire Jonathan Patient, taught him. Instead of delaying gratification, Arthur begins to eat his marshmallows again. Based on the landmark Stanford University study, the marshmallow theory details the results of an experiment where children were left alone with a marshmallow and told that if they didn’t eat it they would receive an additional marshmallow in fifteen minutes. Years later, researchers discovered that the children who had chosen to wait grew up to become more successful adults than the children who had eaten their marshmallows immediately. In Don’t Eat the Marshmallow…Yet! 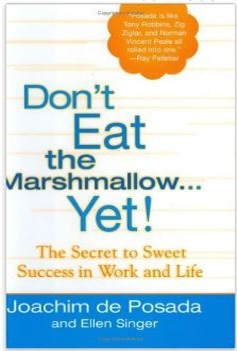 and Don’t Gobble the Marshmallow…Ever!, Joachim de Posada revealed to readers that the secret to success is not merely superior intelligence or hard work, but rather the ability to delay gratification. Now, in Keep Your Eye on the Marshmallow, Posada uses the parable of Arthur’s struggles after reaching the top to teach us that adhering to the marshmallow principle is especially important in uncertain economic times. True success is more than just financial gain or recognition; it’s the ability to balance every aspect of life outside of work—including hobbies, family, and love—in order to enjoy your success, maintain long-term goals, and savor the marshmallows of life. Everyone's favorite stumbling striver returns in another simple and telling parable from acclaimed motivational expert Joachim de Posada. Arthur has been practicing the principles of success, but after he accepts a lucrative new job, he finds himself reverting to his old gobbling habits. Perfect for anyone in transition, this book explains how to apply the principles of success to changing circumstances. In our go-go culture, "wait" has become the most offensive of four-letter words, but patience is not the same as self-sacrifice, and holding out for something you really want is far more satisfying than settling for whatever is available. Don't Gobble the Marshmallow...Ever! teaches the importance of lifelong non-nibbling-and promises sweet rewards. 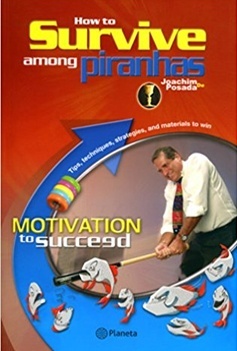 "How to Survive among Piranhas is a mini-encyclopedia containing some of the best ideas available in the areas of business and personal development. In addition to the wonderful ideas on such topics as motivation, sales, marketing, negotiation, and customer service, Joachim De Posada will entertain and fascinate you with personal stories of his life. Read, learn, and enjoy." Michael LeBoeuf, author of "The Millionaire in You"